Course work and MSA student posts, fresh from downtown Toronto to your screen. 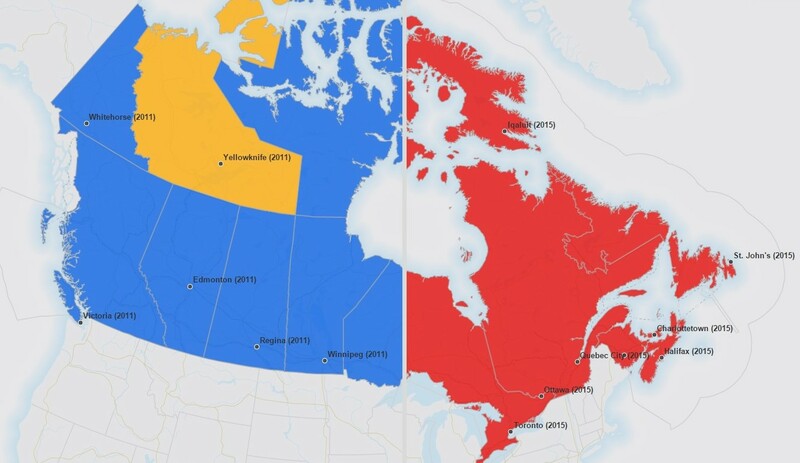 The idea of my project was to comprehensively map the past two Canadian federal election results. When looking for visualization methods to compare this data I came across the Swipe feature on the ArcGIS Online story maps. Along with all the interaction features of any ArcGIS online web map, this feature lets the user swipe left and right to reveal either different layers or in my case different maps. As you can see in the screenshot below the right side of the map is showing the provincial winners of the 2015 election while the left side of the map is showing the provincial winners of the 2011 election. The middle line in the middle can be swiped back and forth to show how the provincial winners differed in each election. The biggest problem in executing my project was that the default ArcGIS online projection is web Mercator, which greatly distorts Canada. I was able to find documentation from Natural Resources Canada explaining how Lambert Conformal Conic basemaps can be uploaded to an ArcGIS online map and replace the default basemaps. Another problem with my visualization of the project was that when zoomed to a national scale level, a lot of the individual polling divisions became impossible to see. This creates an issue because each polling division is designed to have a somewhat equal population count in them. So the small ones aren’t less important or less meaningful than the big ones. To solve this, when zoomed out, I changed the symbology to show the party that had won the most seats in each province, so it would show the provincial winner as seen in the previous screenshot. When zoomed in however the individual polling divisions become visible, showing the official name at increased zoom levels. The years of each election were added to the labels to help remind the user what map was on what side. The methodology I used to create this project was to create two different online maps, one for each election year. Then I created the swipe web app which would allow both of these maps to be loaded and swipeable between the two. It was important here to make sure that all the settings for each map were the exact same (colors, transparency and attribute names). The data that is shown on my maps were all downloaded from ArcGIS online to Arcmap Desktop and then zipped and reuploaded back to my project. It was important to change my data’s projection to Lambert Conformal Conic before uploading it so that it wouldn’t have to be reprojected again using ArcGIS online. This project demonstrated how web mapping applications can make visualizing and comparing data much easier than creating two standalone maps.